The Poisonwood Bible [Audiobook Review] – my books. my life. In 1959, Nathan Pierce uproots his family (his wife – Orleanna – and his four daughters – Rachel, Leah, Adah, and Ruth Mae) from Bethlehem, Georgia and moves them to a small village in the Belgian Congo where he will continue his evangelical ministry. The family arrives just in time for major political upheaval they don’t really understand. Told from the perspective of the five females in the family, The Poisonwood Bible is a tale of the family’s time in the Congo and how it forever changed each of their lives. 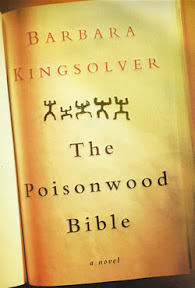 I’ve heard many wonderful things about The Poisonwood Bible. And throughout the first half of the novel, I found myself agreeing with them. Unfortunately, the second half of the novel happened. This really could be two distinct books. In the first half, time moves slowly, and the family struggles together to adjust to life in the Congo. It is interesting to see it differently through each character and put the pieces together to see how the family as a whole is doing. I really did enjoy this part of the book very much. However, in the second half, time moves quickly and the family is less of a family. All of a sudden Rachel is 50 and I wasn’t really sure how that happened. I think it is the difference in how quickly time moves that is the most jarring but the whole book really becomes something different. It is less about the characters and more about the politics. There is an event that happens that can be seen as the impetus for the change in the story’s direction but I just never adjusted. Kingsolver is clearly a talented writer who is not afraid to tackle some controversial issues, and I look forward to reading her again. I am glad that I finally got to this one, which has been sitting on my shelf for a long time (never mind that I ended up listening to the audio). I always find books set in the Congo to be fascinating because it has such a volatile political background. Perhaps if I’d known to expect the change in the novel, I would have enjoyed it more. First point: Dean Robertson is a woman. She is not Robertson Dean. But she did a good job narrating this book. I thought the choice to use one audio narrator for all four narrators of the story was odd at first and was a bit confusing. But once I got to know the characters a bit, it worked. Her matter-of-fact narration allows the listener to interpret the book for herself. I loved this book and read it twice within a short space of time, but have to agree that the second part wasn’t as strong as the first. I would have been happier had the entire book taken place in the Congo. It was a very unique book though, and there was a lot there to ponder over, and become enraged about. I am glad to have read your very thoughtful review of this one. It gives me a bit of a different perspective on the book. Thanks for sharing it with us! I listened to the audio right back when I started blogging, and I completely loved it! I don’t know if I was just so taken with her writing that the change in pace didn’t bother me, or if I was on the newer side of exploring literary fiction on audio or what, but I was quite taken with it all. I do agree now that I think it would have been a more entertaining read if they would have had different narrators for each of the girls. I tried to read this one years ago but I couldn’t get into it. I might try it again sometime. Glad to know that you liked the book, though you didn’t love the book. I can understand how one part of the book could be wonderful while another part could be difficult to relate to. Sorry to know that Barbara Kingsolver forsook plot for politics in the second part. I want to read this book and see how it works for me. I also want to read Kingsolver’s ‘Prodigal Summer’. I read the first few pages sometime back and it was fascinating. I read this one years ago and at the time I absolutely loved it, but many of the details escape me now so I can’t say whether I agree or disagree with your thoughts on the second part of the book. I definitely appreciate your honest review, though!